How many times has it happened that you needed a specific tool on the trail only to remember you’ve left the compass or altimeter at home? On top of that, carrying a bunch of handy tools comes at a price of its own, since you’re the one who has to carry all of the extra weight! However, there might be a solution to all of that – buying the best ABC watch on the market! The ABC watch combines your top three necessities for an outdoor trip: an altimeter, a barometer, and a compass, leaving you tofeel confident in the great outdoors. They provide a lot of value for outdoor activities as these beasts were constructed with rugged use in mind. As if that wasn’t enough, then you should know that most of them have even more features apart from their basic ABC ones. However, picking the right one out of the many offered on the market isn’t an easy task. That’s why we’ve put together a small guide for you on the features and characteristics of these dynamic timepieces to help you figure out what might be the best buy for you. Keep reading on to learn more! 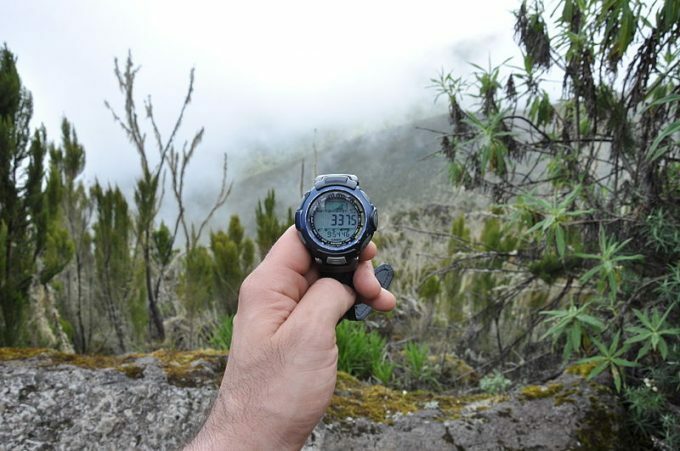 The A of the ABC refers to the altimeter – the ability of the watch to assess the altitude that you are currently on. Though it isn’t 100% accurate, this can provide the best estimate when it comes to elevation. 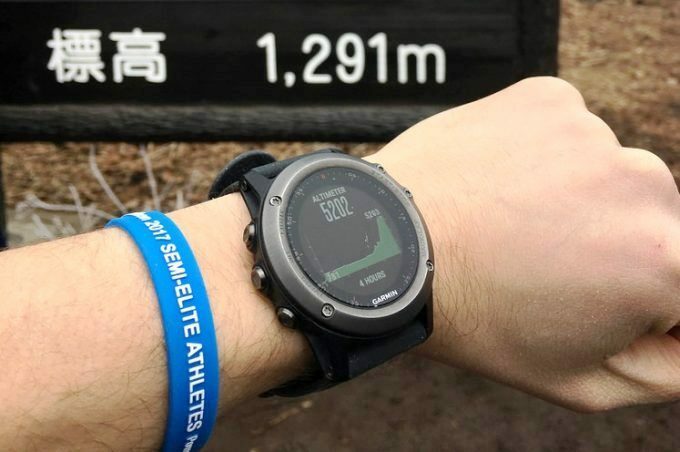 The altimeter feature might be handy when you’re doing hikes or mountaineering – it will help you stay more or less aware of the altitude you’re on and help you avoid altitude sickness. Also, having an accurate altimeter might be useful in assisting you toplan the remaining of the day, as it’ll clearly indicate you how far you’ve come. Most watches on our list should be pretty accurate when it comes to the altitude. However, if you intend to use the watch at higher altitudes, make sure it comes with an accurate altimeter before buying it. The B part of the ABC refers to the barometer – the ability of the watch to gauge barometric air pressure. 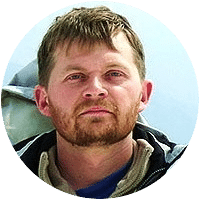 When accurate, this will allow you to be a step ahead of Mother Nature while you are out in the wild and more or less, predict sudden weather changes. A sudden decrease in barometric pressure is a probable indication of incoming strong rains, which means – it’s time to look for shelter! A sudden high increase in barometric pressure is a potential signal of strong winds. Bits of information like that can help you make good decisions while in the field. The C of the ABC is for the compass. Recent technological advances have raised the accuracy of the digital compass and the ones on the ABC watches are no exception. While most watches should be accurate when it comes to the compass, if you’re on an unknown terrain, it isn’t wise to solely depend on the compass of your ABC watch. In order to increase the accuracy of readings, it’s important to calibrate ABC watches from time to time.How often this has to be done will vary depending on your activities. How often do you camp out? It’s best to calibrate the watch for every trip or every large bit of altitude change. Google Earth is a great help in identifying estimates for recalibration. If you’re buying an outdoor – or survival/military – watch, then it’s a smart to look whether the watch is waterproof or at least, water-resistant to acertain extent. After all, you can never know for sure when you’ll need your watch to be able to take a few splashes when taking it outdoor. ABC watches are generally safe in the water and most of them offer water-resistance up to 330 ft. But if you’re a diver, you will want a watch with a higher water resistance rating as deep dives will definitely ruin your watch. Looking whether a watch has decent ABC is essential – but many of the ABC watches come with plenty other features such as a GPP, a heart rate monitor, backlight, alarms, world clock, etc. Pick your extra features depending on your needs. For example, not everyone wants or needs the GPS feature. However, it might be a useful feature when it comes to survival. On the other side, if you’re looking to buy an ABC watch for running on the trail, then a heart rate monitor is definitely a recommended additional feature. However, the more the extra features your watch has, the faster the battery will drain. Most often, extra features mean you’ll also have to spend a few extra dollars to receive the quality you’re expecting. Generally, ABC watches will be more on the rugged side, given the fact that they’re used in the outdoors. Recently, however, manufacturers have been working to bridge the gap to fit ABCs to smart casual attire, so you can get the most out of them and easily include them in your day to day wear. The look may be a matter of concern for you but when talking about the design, then don’t forget to think about the weight. It largely depends on what you do outdoors. Activities calling for large amounts of physical exertion and endurance such as distance running and mountain climbing may call for a lighter watch. Whatever your activities are or what you intend to use the watch for, battery life should definitely matter to you when deciding. You don’t want the watch dying at the worst possible moment and leaving you without guidance outdoors! Most often, ABC watches come with replaceable or with fully rechargeable batteries, though finding ones with solar charging isn’t impossible as well. Some models can also be USB charged, which is a handy feature. Doing the pick depends mostly on what you prefer the most, as well as the ease of use you’re expecting out of your watch. While we agree that it’s a hassle to regularly change batteries, batteries with solar charging might cost more. With all of that in mind, let’s go through a few great ABC watches in the market today. 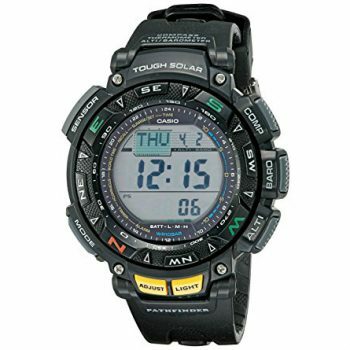 The Casio Pathfinder Triple Sensor Sport Watch is a great all-around ABC watch. It employs a solar based self-charging mechanism relieving you of the constant need to change your batteries. This feature is great on an ABC watch, especially if you find yourself in an indefinite survival situation where dead batteries will not be replaceable. While being fully solar powered, the Pathfinder can last as long as 6 months without sunlight exposure. The water resistance rating it offers allows for some light swimming but not ideal for handling deep water. The built-in barometer and altimeter measure altitude changes in increments of 20 feet. The internal thermometer also allows you to accurately assess temperature (when it’s not on your wrist), but it only goes as low as 14F which may be a deal breaker for climbers who bring their watches in the most extreme conditions. The watch backlight is great for night work, even setting it alongside other ABC watches. Related: Even if you wouldn’t need a battery replacement for this watch, you might be interested in getting the Casio Genuine Factory Replacement Band. 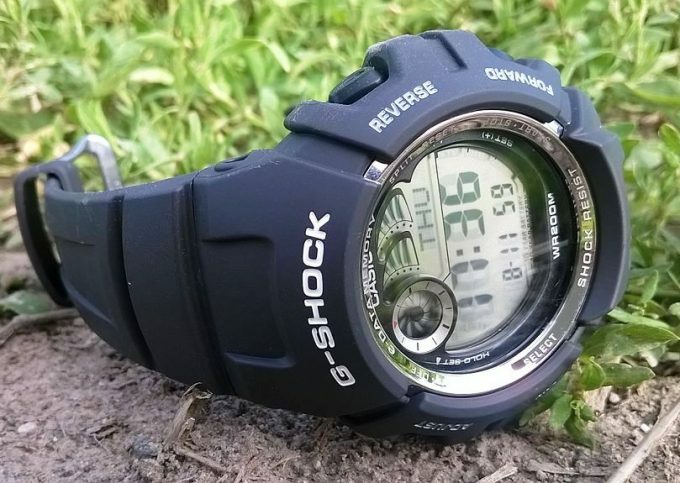 This replacement band has been made specifically by Casio specifically for the Pathfinder Watch series and can easily transform your watch into a real camouflage timepiece at the fraction of a cost. 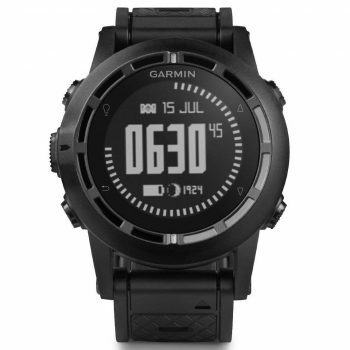 The Garmin Fenix 3 GPS Watch is an incredibly versatile and feature-rich ABC watch. 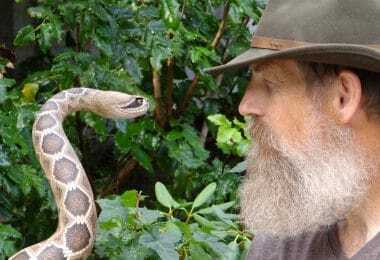 It’s an amalgam of the features that make ABC watches the favorite of outdoorsmen as well as numerous fitness and connectivity features that make it an ideal choice for the modern outdoor backpacker and athlete. 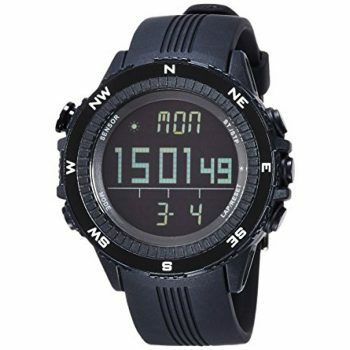 The watch has solid ABC capabilities and standard water resistance rating makes it an ideal choice while taking on the outdoors.The GPS provides tracking capability in addition to the navigation features. This allows you to see a trail connecting where you’ve been to where you currently are. The wireless connectivity option allows it to connect to the internet via portable Wi-Fi of iPhones or other newer smartphones. This provides users with access to ConnectIQ, a software platform allowing for the display of various data fields, customizable at your fingertips. It allows for several additional features if used with a heart rate monitor such as the Recovery Advisor. The watch also allows you to effectively track running, swimming and skiing data such as speed, the number of strokes and pace. The internet connectivity also allows you to check on notifications such as emails and texts from your watch. The USB charging option replaces the need to replace batteries often. 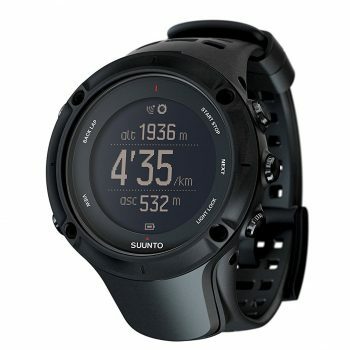 In training/GPS mode, the battery lasts 20 hours in UltraTrac mode and 6 weeks while in watch mode. The variety of styles and colors allows you to find a watch that suits your style. 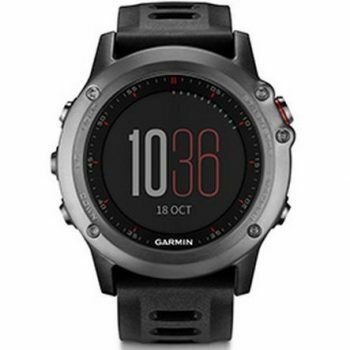 Related: If you’d like to prolong the durability of your watch, then consider getting the IQShield Garmin Fenix 3 Screen Protector – a bubble-free protection that you should be able to easily apply on your brand new Garmin watch. The product comes with an installation kit that promises to give you that much-needed protection to your screen while meanwhile, saving you the headache of unsuccessfully applied screen protectors. 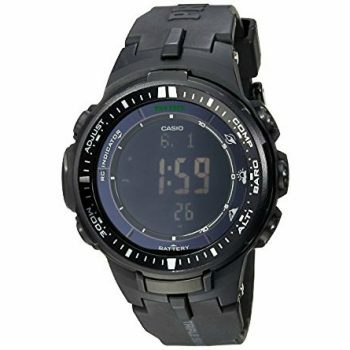 The Casio PRW-3000-1ACR Protrek Watch is another fine example of Casio’s watch-making expertise. 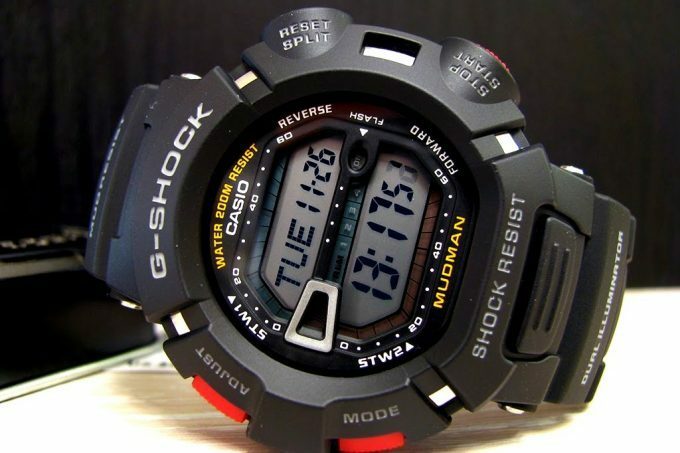 This line of watches is a successor to the Casio Pathfinder series. This ABC timepiece packs Casio’s Triple Sensor Version 3 engine. This bit of innovation has allowed them to improve the efficiency of the watch in terms of employing a much smaller direction sensor as well as a large decrease in power consumption. The PRW 3000 Protek boasts a 7-month battery life, all without recharging. This is pretty impressive as it is a solar-powered watch. Another great advantage here is that this doesn’t feel like a hockey puck on your wrist. It’s noticeably smaller than its other siblings in the Protrek line as well as other ABC watches. That may or not be a put-off depending on preference. The lightweight is definitely a plus for anyone who takes it for a climb or long bike ride. If you take a look at the price, you might get a pretty decent watch for a smaller price when compared to another watch. To sum it up, if you’re looking for a smaller watch that will be able to take on the occasional splash without feeling too bulky on your hand, this may be the way to go. Related: If you’re a watch enthusiast, then you might be interested in getting the Ohuhu Leather Watch Box – it’ll allow you to keep your collection safely tucked away from dust and scratches. Apart from coming at a great price, the box comes available in different sizes, allowing you to pick the one that works best for you. The box can also be used for storing other valuables. 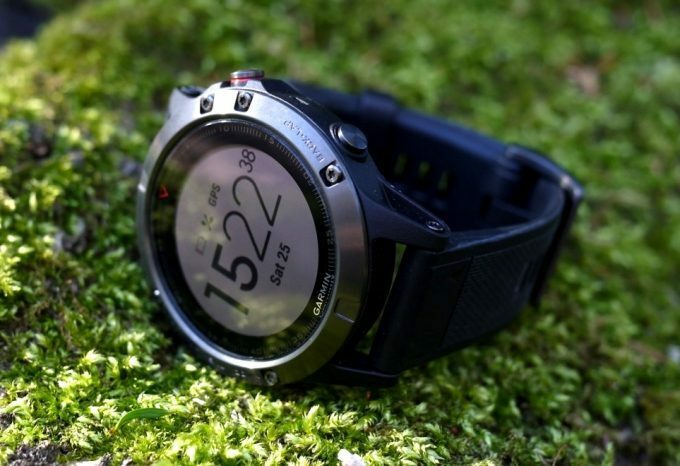 The Garmin Tactix GPS Navigator is among the spiritual successors to their Fenix line. Software that Tactix runs is 95% identical to that of Fenix. 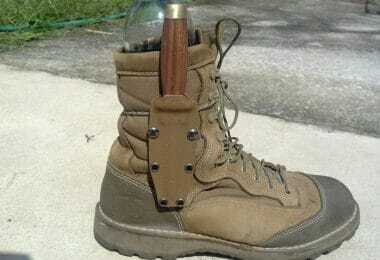 The Tactix (as the name suggests) was built for those more inclined with the tactical and military fields. The inverted display highlighted white text and numbers over a black background is interestingly night-vision friendly. The non-reflective surfaces and curved glass surfaces are intended to lessen chances of the watch reflecting light at an ill-opportune time. The watch also has a Jumpmaster feature going beyond assistance for regular jumps to include high altitude low opening (HALO) and high altitude high opening (HAHO) jumps. Both of which are done almost exclusively by military units. The watch also features the standard ABC offerings and executes quite well. It includes a magnetic compass which differentiates itself from GPS-based compasses because it can get a decent reading even if you’re standing still. While the watch is a solid buy definitely worth looking at, it isn’t as waterproof as most would like it. In fact, the waterproof rating doesn’t even recommend it for snorkeling or deep diving. The 160-feet rating would even make it risky to take into a pool for light diving and lapping. This is a potential deal breaker right here, especially noting that Garmin has had waterproofing concerns in past watches. Related: If you get easily bored from the same watch band all the time, you might want to try out the Wearable4u Garmin Fenix Replacement Watch Band – it’s a silicone band at a great price! Apart from being very soft and comfortable to wear, the replacement band might be a good option if you know you’ll be dealing with plenty of water. The band comes available in almost a dozen different colors. 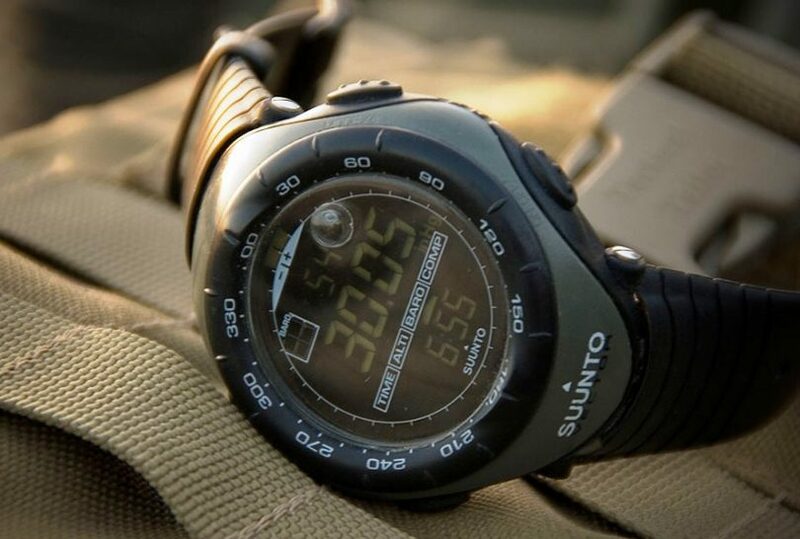 There is a good reason why Suunto remains among the benchmarks in the field of outdoor timepieces. The focus on precision, style,and functionality are hallmarks that have kept it as a favorite timepiece for outdoorsy folks and endurance athletes alike. The Ambit3 Peak GPS Unit Watch certainly bears that legacy well. The Ambit 3 provides altimeter, compass, and barometer readings with a high-degree of accuracy. The 330-feet water resistance will help you stay at ease while taking it to the pool.In fact, this model is among the most recommended for fitness enthusiasts who want to gauge themselves while in water. The watch is available with and without a heart rate monitor. The great thing about that is that when used with its heart rate monitor, it can handle measurements even under water.It also packs a sync feature allowing you to send your data to your phone for easy review and sharing later on. The sleek and almost tactical look go well whether you’re sweating it out in the gym, going for an outdoor run or spending a day wearing smart casual at the office. If you’re looking for a decent watch for a variety of activities, this model shouldn’t disappoint. Related: When outdoors, you never know what might happen to your gear, watch included – so it’s best to be on the safe side and get yourself something like the SE Eyeglass and Watch Repair Screw Kit! The kit comes with more than a dozen different screws and it can be used to repair more than 250 eyeglasses and watch models. 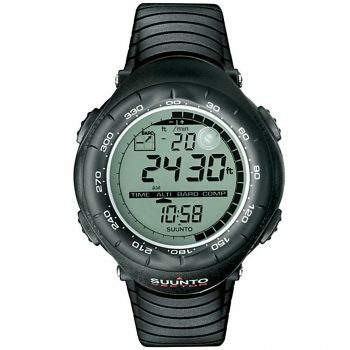 While this is among the older models on our list, the Suunto X-Lander Computer Watch is still a strong option despite the newer market offerings and doesn’t disappoint in the slightest. The X-Lander was and is marketed as a military watch and hence, it’s great for rugged use. In terms of features, it doesn’t pack the bells and whistles newer timepieces have. 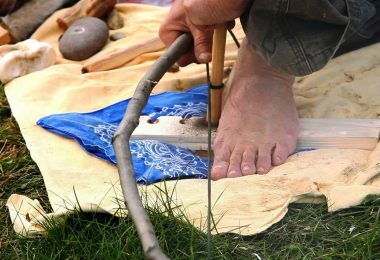 But it’s capable of going head to head with recent offerings if you’re simply talking about making it work for the most basic outdoor functions. Actually, many might find it appealing exactly for those reasons! Coming in a striking black color, you can bang it up while camping, trekking or fishing and it’ll work just fine. The altimeter, barometer, and compass function with a high level of accuracy – and if you think about it, at the end of the day, what more can you need from a decent military/outdoor watch? You can take the watch with you while swimming though you might want to skip diving to deeper ends – the watch can take up to 330 feet without concern. All in all, it’s an overall good outdoor watch. Related: The Suunto Xlander ME Strap is here to save the day if your X-Lander watch band somehow breaks down! Coming in a sharp black color, the band is sturdy enough to give you a few more years of use to your watch. The band is available in two materials, leather or rubber, allowing you to choose whatever works the most for your needs! The Vestal The Guide Stainless Steel Digital Watchis one of the lesser known entrants to the ABC watch market – you probably wouldn’t think of a digital watch first when it comes to standard ABC watches. However, despite being lesser known, it doesn’t mean it’s a lesser of a performer. In all fairness, it’s a bit heftier than its competitors which may be fine with those who want a more rugged feeling watch but also might be a disadvantage to those looking for a lighter model. The metal is relatively thicker on the timepiece as well, giving you prolonged use. However, even though it’s thicker and heavier than most models, the watch is rather elegant-looking at the same time, so it wouldn’t look odd even if you decide to wear it day to day. Chances are, it won’t look much different than most men’s watches out there. The timepiece offers the most basic ABC functionality alongside with a weather forecast. The bi-directional bezel and the compass will aid you in quickly finding your path while out in the field. Surprisingly, the watch also comes with a titanium emergency whistle which is of itself a great survival tool. Related: In case your favorite watch breaks down, don’t despair – you could easily fix it by using the Ohuhu Watch Repair Tool Kit – it’s a multifunctional set promising to make your watch last forever! Coming in a sturdy and durable box, you could also use the kit to safely perform the most basic maintenance or repair tasks on your watch, such as battery changing or watchband adjustments without accidentally damaging your timepiece. This is the single German watch that we will be featuring on this list and one of the reasons why it stands out is the price. 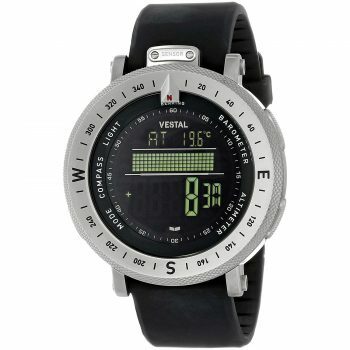 The Lad Weather Digital Quartz Black German Sensor Sport is very, very, cheap when compared to the others on the market. It provides the altimeter, barometric and compass readings just like the other watches on this list do. Though the accuracy of this watch might not be as good as the rest, so you might be disappointed if you’re looking to buy something with a high accuracy. However, there are still plenty of other features added and you’re very likely to get some good use out of the power saving mode. In terms of water resistance, it leaves a bit to be desired. The watch isn’t the best option to take with you when on a snorkeling or light scuba trip, though we think it’s safe to say you can expect it to withstand a few splashes of water. Overall, this can be a good watch if you’re looking to only occasionally wear it on your camping and hiking trips. Optionally, this could be a great option for junior hikers and outdoor lovers – they’d be able to keep track with adults at pretty much the same rate, for a pretty low cost. Related: The Mudder Spring Bar Repair Tool might be just the thing you need for repairing your watches’ wristbands! Apart from fitting with most brands, the tool is small and light enough to easily be carried around and it won’t take much storage room in your tools box. 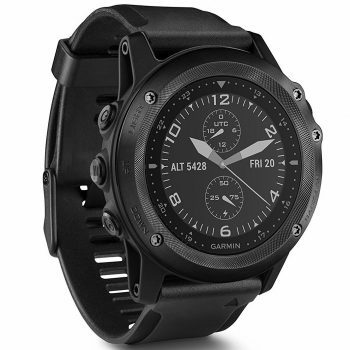 The Garmin Tactix Bravo Watch is definitely worth a mention when it comes to ABC watches. If you’re looking for an ABC timepiece with enhanced functionality and added features, then you will probably want to take a look at this. 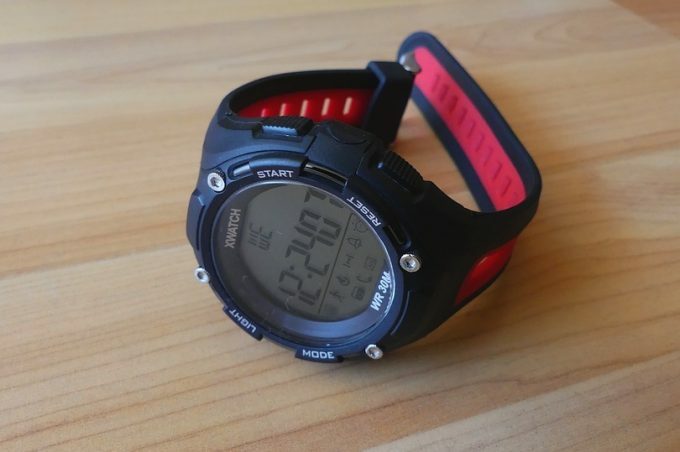 The Tactix Bravo is a well-built sturdy watch that shouldn’t fail you on or off the trail! As an ABC watch, chances are, it does its job more than well. Sensors provide up-to-date information on air pressure, altitude, and bearing. The watch can display trends in air pressure to help you get accurate weather prediction. The electronic compass does a good job of keeping you on the right track. The watch has Jumpmaster Activity and smart features for physical activity.It also provides smart notifications provided that you have a compatible device, so you can say goodbye to missing out on important emails or texts. The materials of which the watch is made are pretty durable – the band is available in both nylon and silicone options. Like the rest of the Tactix series, it has a number of tactical features that set it apart from the general ABC market and thus, it can be said this is a great survival watch as well. The great durability and functionality and style come at a price, a pretty steep one at that. But if your budget isn’t too tight, then the Tactix Bravo is definitely not a bad investment! Water-resistance is only limited to 330 ft.
Related: Keep your new watch scratch fee with the BoxWave Garmin Tactix Bravo Screen Protector. As the name suggests, this screen protector is specifically designed for the Gamin Tactix Bravo watch and it should help you get the most out of your watch.A thing you might find useful is that the protector is available in two different options: the anti-glare one and the crystal clear one. With all of that being said, we hope we’ve helped you out when doing your next buy. These are just some of the ABC watches you can find on the market. When choosing the one for your next purchase, remember to consider your needs first, as well as the overall functionality of the watch you’ve chosen. Don’t forget – underspending and not getting the value you want will only lead to regret. Be sure to check your options before buying your next watch. What’s your favorite ABC watch that hasn’t failed on you? Do you think there’s something else buyers should consider when buying a watch? If that’s so, leave us acomment and let us know – we always appreciate the feedback from our readers!